We all know Pop-Tarts are a fun, sweet treat. But did you know they double as a fun, sweet craft too? 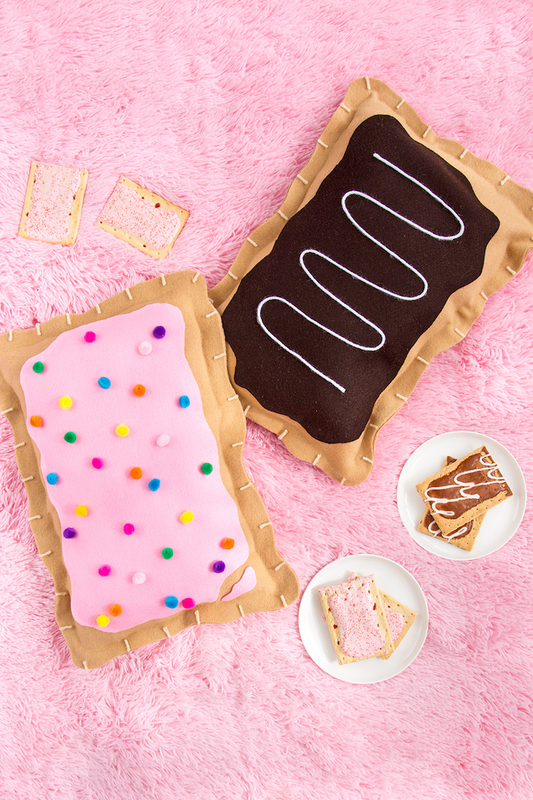 These DIY Pop-Tart pillows are the perf accent for any room, whether that be your foodie BFF's bedroom or your own—because who doesn't love a playful decor accessory! 2. Glue the two tan pieces together, leaving one side open for stuffing. 3. With the pink felt, cut out a smaller rectangle than the "crust." (This will be your "icing.") You want about a 3-inch border of the "crust" showing. 4. Glue your icing to the middle of your "crust." 5. Fill the inside of your pillow with cotton stuffing and glue the opening shut. 7. If you want to get super detailed, cut 1/4" inch piece of yarn and glue (evenly spaced) around the edges of the "crust." Viola—a perfect, pretty Pop-Tart pillow. Tell us in the comments below, what are your favorite poptart flavors?